Fed up of that old Christmas tree being past down generations and planning to buy a new one? Well, here’s a novel way to discard your old tree. Recycle! 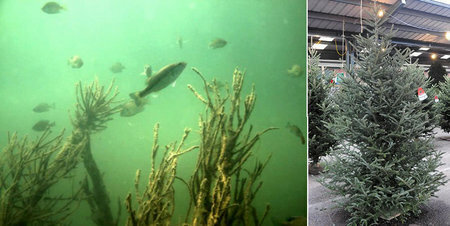 Christmas trees act as an artificial habitat for fish in lakes. These discarded trees are collected by DNR (Division of Natural Resources) every year and are sunk into the lakes of West Virginia. They act as artificial reefs and help provide the fish with hiding places to ambush their prey. According to Scott Blake, a diving enthusiast from Tyler Mountain, these trees are extremely beneficial to fish breeding in lakes and he has first hand proof of this! He captured pictures of various game fish like the largemouth bass, crappie bluegills and muskellunge live in vegetation provided by these recycled Christmas trees in reservoirs like Braxton County’s Sutton Lake and Nicholas County’s Summersville Lake. So the next time you dispose of your old Christmas tree, make sure the DNR get hold of it so that it can be used to give these fish a new home.